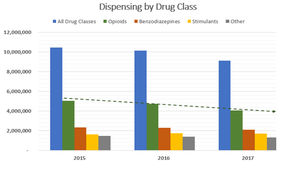 Earlier this year the Controlled Substances Board (CSB) released the 2017 WI ePDMP Report, including trend analysis of controlled substance dispensing in Wisconsin. The report highlights a 14% decrease in the total number of monitored drug prescriptions dispensed and a 20% decrease in the number of opioid prescriptions dispensed from 2015 to 2017. Review the full report here. Look for the Add Alert button on the Patient Report just above the Patient Demographics. Prescriber Led Alerts are visible to other healthcare users of the WI ePDMP but are not made available to non-healthcare users, such as law enforcement. Once added to a patient record, the prescriber can remove a Prescriber Led Alert if it is no longer applicable. This functionality is available both via EHR single sign-on integration and by accessing patient reports through the WI ePDMP website at https://pdmp.wi.gov/. This self-assessment tool for prescribers has been enhanced to display an individual prescriber's metrics for the last 100 days in comparison to other prescribers of the same specialty. The report provides prescribers with a summary of their average patient MME, their prescription orders dispensed, their patients with alerts and their WI ePDMP usage. Although not part of the most recent enhancements, another valuable WI ePDMP tool for prescribers is the Patients Panel, which displays a snapshot of critical information about patients to whom a prescriber has recently prescribed a controlled substance, including current MME and whether the patients have any data-driven or law-enforcement-reported alerts. At this time, the Prescriber Metrics Report and Patients Panel are not available via single sign-on EHR integration. To access these valuable tools, log in to the WI ePDMP website at https://pdmp.wi.gov/. DSPS strives to make the WI ePDMP meet its users' needs. Your feedback is valuable to the continued success of the WI ePDMP! Watch for a request to complete a brief survey. The WI ePDMP user survey will be open until the end of April and provides DSPS with valuable user feedback for future WI ePDMP enhancements. User groups will be forming in 2018 to continue gathering input for new functionalities. Stay tuned for more information about how to join. To receive future updates about the WI ePDMP, make sure you are subscribed to PDMP Updates: Manage Subscriptions. You can also "Like" our Facebook page to keep informed about enhancements to the WI ePDMP: https://pdmp.wi.gov/news. Please contact us at pdmp@wisconsin.gov.